The unbeaten California invader Instagrand headlines the Grade 3, $300,000 Gotham Stakes at Aqueduct, with this stop on New York's road to the 2019 Kentucky Derby paying out qualifying points to the Top 4 finishers on a 50-20-10-5 scale. Trainer Jerry Hollendorfer’s decision to send Instagrand to New York looks like a brilliant move with the news that the San Felipe (G2) had to be postponed due to the temporary closing of the Santa Anita Park. Instagrand will be joined by the California based Bob Baffert runner Much Better going a one-turn mile. The Gotham, carded as Race 10 of 11, is scheduled to go to post at 5:09 pm ET. Here is a full field analysis with morning line odds by Horse Racing Nation. Family Biz [ML 20-1 – Fed Biz – E. Barker/K. Carmouche – 7: 1-2-2 - $104,855 – 2 Derby points] Family Biz started his 3-year-old season with a third-place finish in the Jerome on New Year’s Day. Since then he ran fourth in both an Aqueduct allowance and then in the Jimmy Winkfield. He faces a major class challenge in the Gotham. Toss. Knicks Go [ML 12-1 – Paynter – B. Colebrook/J. Lezcano – 7: 2-1-1 - $658,515 – 18 Derby points] Knicks Go had an amazing juvenile season as the longshot winner of the Grade 1 Breeders’ Futurity, which he backed it up with a second-place finish in the Breeders’ Cup. He came up empty on the slop at Churchill Downs in the Kentucky Jockey Club. To start his 3-year-old campaign, Knicks Go disappointed as the favorite in the Sam F. Davis (G3) at his current Tampa training base. It is interesting that trainer Ben Colebrook ships to New York instead of staying home and running in the Tampa Bay Derby (G2), also on Saturday. His best efforts came when he ran on or just behind the early lead. Toss. Mind Control [ML 9-2 – Stay Thirsty – G. Sacco/J. Velazquez – 5: 3-1-0 - $323,400 – 10 Derby points] The Gotham has served as the goal for Mind Control since his front-running victory in the Jerome that earned him 10 Derby qualifying points. He'll remain at a mile here looking to get the points needed for the Derby before facing a longer distance test. The Gotham field has turned out to be far tougher than originally expected especially with the amount early speed. Use underneath. Much Better [ML 5-1 – Pioneerof the Nile – B. Baffert/M. Smith – 5: 2-1-1 - $102,200 – 2 Derby points] This Bob Baffert trainee is looking for his niche in the 3-year-old division. He began his career as one of many heavily bet first-timers to win as a 2-year-old at Del Mar. In an unusual move for the barn, Baffert switched him to the turf at Santa Anita, where he became stakes-placed. In over his head, Much Better finished last in the Breeders’ Cup Juvenile Turf. Turn the page on the calendar and Baffert sends him on the Derby trail to run third in the Sham (G3). Most recently, he was a front-running winner of an allowance sprint at Santa Anita. With Santa Anita closed, Mike Smith will fly in to take the mount. Is the one-turn mile of the Gotham an ideal fit for him? Trifecta possibility. Instagrand [ML 4-5 – Into Mischief – J. Hollendorfer/J. Castellano – 2: 2-0-0 - $144,000 – 0 Derby points] The only thing this Jerry Hollendorfer trainee has done on the track is win two sprints by 10 lengths apiece, accomplished in a June maiden win at Los Alamitos and then in the Best Pal (G2) at Del Mar. Owner Larry Best, who purchased him for $1.2 million as a 2-year-old, wrapped him Instagrand for the year to prepare for the Derby trail. "The distance of the race seems to be a better place to start going a one-turn mile rather than a mile and a sixteenth at Santa Anita. He's training very nice. We think we have the horse good enough to run," said Hollendorfer. "He was always a well-meant horse, and Larry Best spent quite a bit of money for him and he's proven to be worth it." Instagrand will try the mile distance for the first time having gone no further than six furlongs last year. Here, he'll face several others who prefer to run on or near the lead, and must ship across the country for the first time to race on the deep Aqueduct track. There is a good chance that he is just much faster than his competition. Top choice. Not That Brady [ML 12-1 – Big Brown – R. Rodriguez/R. Gutierrez – 6: 2-2-0 - $155,900 – 4 Derby points] After winning a New York-bred stake in fine fashion, trainer Rudy Rodriguez decided to take a shot in the Withers and he ran big, losing to Tax by just a head. He earned four Derby points and now cuts back to a one-turn mile from the nine-furlongs which should suit him well. Still, the Gotham is a much tougher test, and he has dealt with a quarter crack between races. Toss. Tikhvin Flew [ML 20-1 – Street Sense – S. Asmussen/D. Davis – 2: 1-0-1 - $55,400 – 0 Derby points] This son of Street Sense has been in the New York based division of the Steve Asmussen barn since his impressive debut victory in January at Aqueduct. In his second start he was third in the Jimmy Winkfield last month behind Haikal. Since then he has been training smartly and does have the home track advantage. But Tikhvin Flew faces a major class hike in his first try on the Derby trail. Toss. Summary: This renewal of the Gotham brings together one of the race's strongest fields in recent years given the mix of horses shipping in versus those with prior experience at Aqueduct. There's also an intriguing dynamic between those that like to be on or near the lead and clear closers. The deep and tiring track at Aqueduct is not an easy surface for shippers. However, for the most part, the Big A has been a very fair surface on which race dynamics have determined the winners. The horses that prefer to push the early pace like Instagrand, Mind Control, Knicks Go, Much Better and Not That Brady should provide an ideal scenario for the closers. 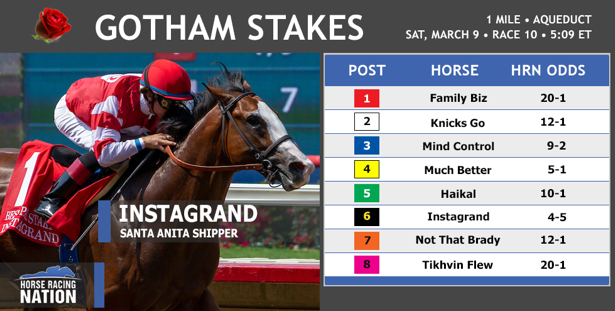 The bottom line in the Gotham is that regardless of how many speed horses there are in the field that Instagrand may just be too fast for all of them, leaving the rest to battle for the place spot.